The PS Murray Princess is the largest paddle wheeler (also called a stern wheeler) in the southern hemisphere, offering an authentic cruise experience on South Australia's Murray River. The ship was built in 1986 by Goolwa Ship Construction PTY Ltd at Goolwa, near the mouth of the Murray River; it was commissioned by the entrepreneur Captain Keith Veenstra, whose first vessel was the Murray River Queen in 1973. The story goes that Captain Veenstra travelled the world in the early 1980s looking for something special for his next marine building project. After visiting the Mississippi in the United States and seeing his first wedding-cake-style, stern-wheeler paddle boat, he decided this is what he was going to build for the Murray. Larger than other vessels on the river, the Murray Princess is built from steel and hardwood timber, with decorative lacework, a matching pair of smokestacks and a working paddle wheel that drives the ship. The wheel is 9 metres (29.5 feet) tall and has a diameter of just under 6 metres (20 feet); the original was just replaced in early 2015. The ship sits low on the water, with a waterline length of just over 67.4 metres (211 feet), an overall length of just under 70 metres (230 feet), and width of 14 metres (46 feet); that makes it just small enough to fit through the Murray's locks, and under the Paringa Bridge near the Victorian border. However, it's the draft of just 1.1 metres (3.6 feet) that enables the distinctive paddle wheeler to navigate the Murray's waters, which vary in depth and have been low in the recent past. Currently the river is deemed "full," which makes the best conditions possible for cruising. Captain Cook Cruises (part of the Sealink Travel Group, which operates cruises in Sydney, Fiji and the Great Barrier Reef) bought the Murray Princess in 1988. It was a natural fit for the local, small-ship cruise line, offering a relaxing and informal way to explore one of Australia's iconic waterways. It cruises at a leisurely six knots, exploring townships by day and tucking away in quiet mooring spots at night. The ship has a traditional interior decor to match her exterior stateliness, embracing the paddle wheelers of a bygone era with dark wood, dark leather and brass fittings. As is the style of authentic paddle wheelers, outside cabins open onto a shared deck, and there isn't much outdoor space. The ship is showing its age in places, but a 2012 dry dock renovation included upgrading some cabins and staterooms with a more modern look. Further enhancements including additional cabin makeovers took place in January 2015. The Murray Princess is very much an experience appealing to a mature audience, with plenty of early mornings and early nights; on our cruise, the passengers were exclusively retirees, the eldest a former pilot from New Zealand who was 92. It's also a very communal experience with shared tours and meals, aimed at getting people to mix and mingle, sharing stories about their lives as well as their days on board. To make the process easy, on embarkation you're given a Captain Cook name tag which has your first name, the Australian state or country you're from, and your dining table assignment number written on the front, so you quickly get to know your shipmates. 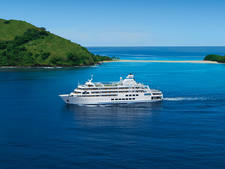 Many were seasoned cruise travellers who had sailed previously on the high seas and on river cruises in Europe. The Murray Princess is all about the great outdoors and exploring. The landscape along the river is rich and varied, ranging from wetlands to sheer limestone cliffs. Gum trees cling to the sides of the cliffs, birds including cockatoos and corellas nest in holes in the rock face, sea eagles soar overhead, and huge pelicans skim the waterline. Along the way the river bank is dotted with tiny townships and settlements steeped in history; regardless of where you are on the river, activities on a given day can range from wildlife spotting to nature walks, and history tours to wine tasting. It's a relaxed and casual experience with an "open-door policy," which allows passengers to chat with the captain in the wheel room (what they call a bridge on these types of vessels) at any time. There are a few shortcomings which may disappoint younger or traditional cruise fans; a lack of open deck space and the absence of a pool or a jacuzzi are the most obvious. It's not an all-inclusive experience; you'll rack up extra charges for all alcohol, soft drinks and specialty coffees; and additional shore experiences including the Bush Tucker Breakfast and Nocturnal Tour in Sunnydale. Transfers from three pickup points in Adelaide are included in the fare. Overall, a cruise on Murray Princess is a fun and enjoyable (if not inexpensive) experience; for many people who go, it's undoubtedly a "bucket list" trip. If you enjoy relaxed cruising, community spirit, exploring quaint townships and seeing plenty of wildlife, it is one to put on the list. And there's no chance of getting seasick. Fellow passengers hail mostly from Australia, with some from New Zealand and occasionally others from the United Kingdom or the United States. A Murray Princess cruise is very much a grown-up experience attracting mostly older baby boomers and retirees aged 60-plus, with single cruisers also welcome. When it comes to families, however, the ship has no specific facilities or fares for children; given the demographic it attracts, it is unlikely you'll see any junior cruisers on board. Generally, smart casual clothing is all you need on board the Murray Princess, with sportswear or shorts during the day (depending on the season), and no formal nights except for the Captain's Dinner on the final night aboard, where Captain Cook says a jacket and tie for men, and cocktail dress for women, "won't be out of place." Other essentials include sport shoes or flat walking shoes for tender boat rides, walking on deck, and onshore activities; swim wear for the warmer months; and a long-sleeved shirt and pants for sun protection. In the winter, warm layers and a weatherproof jacket can be useful for excursions, going ashore, and sitting outside. Tipping is an optional practice in Australia, so passengers don't have to tip on Murray Princess. They are welcome to reward a crew member they feel has gone above and beyond the call of duty. The ship operates a cashless system (you charge your expenses to your cabin) and payment is in Australian dollars.